Back in May of 2011, I posted an article about the Justin Liquor Co..
"On August 14, 1906, a saloon license was granted to Taravellier and Cames to be located at 2768 Mission. The post earthquake 1906 Crocker Langley states simply, Taravellier and Cames, liquors, 2778 Mission (I verified both addresses and am guessing that the discrepancy is a typo error). No mention of the Justin Liquor Company at all". 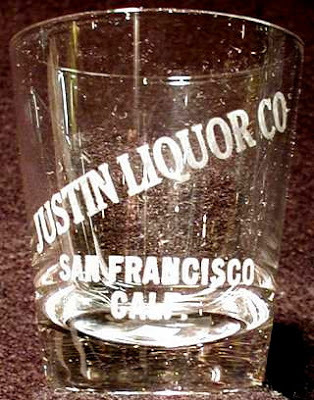 The assumption being that they (Justin Liquor Co.) had fallen victim to the aftermath of Great Earthquake and Fire that had leveled the city and forced so many liquor wholesalers into bankruptcy. 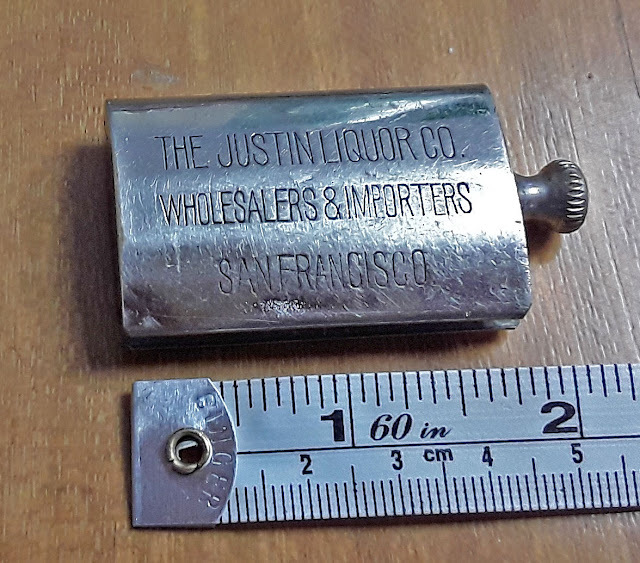 "a stick type stryker (sic) advertising cigarette lighter with the name `THE JUSTIN LIQURE CO` `WHOLESALERS & IMPORTERS, SAN FRANCISCO"
I had to admit that, nope, I never have. OK, he had my attention. And so I asked if he'd send me photos. He did. Wow! Just when you think you've seen it all, up pops another "one of a kind" piece of giveaway advertising. The first photo shows the words "Justin Liquor Company / Wholesalers and Importers / San Francisco" in big bold letters. The other side has a picture of their full quart cylinder with the words "Bond Value" on the label. 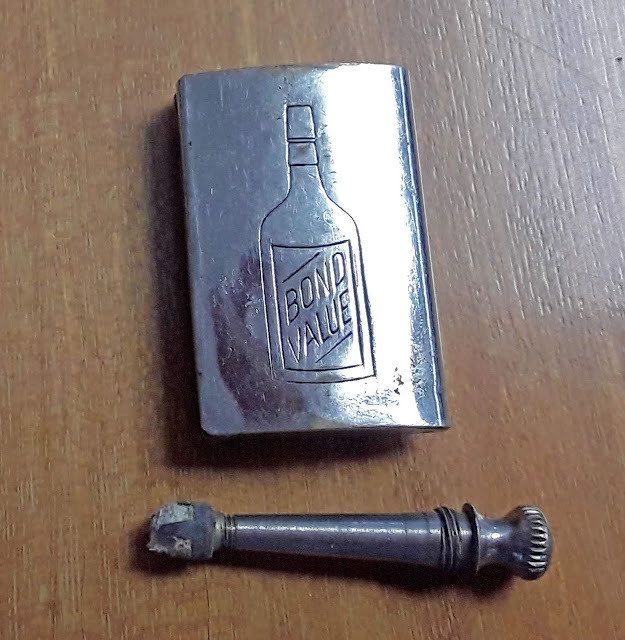 Best guess is that they were pushing their product as being "bottled in bond" which was a practice whereby the product was distilled, aged and bottled in bond under constant supervision of the US Govt., thus assuring the buyer that they were buying pure, unadulterated whiskey which was superior to that which was not "bottled in bond"; (at least in theory...). 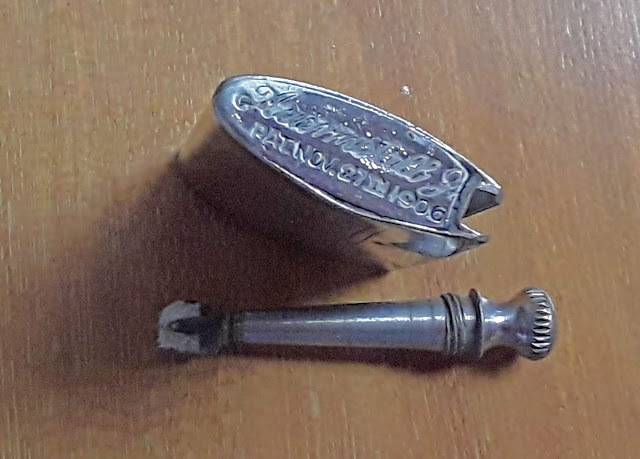 The final photo he sent showed something on the base that made me take a step back. 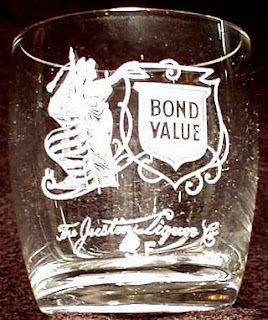 The striker had a patent date of Nov. 27, 1906, several months AFTER we assumed that The Justin Liquor Co. had been leveled and gone out of business. I double checked the SF Directory for 1906, thinking that I'd missed a listing. Nothing. Ditto for 1907. Nothing in 1908 either. Not wanting to accept defeat, I tried researching newspapers for those years in hope of finding an advertisement for Justin following the calamity; again zilch. And then, on April 19, 1909, an article appeared reporting a theft at none other than "The Justin Liquor Co.". Seems then as now, crooks aren't the sharpest pencil in the box, as the article points out. A search of the 1909 Directory confirms that J. Taravellier and L. Cames were indeed doing business as "The Justin Liquor Co." trying to make a comeback out of their saloon located at 2786 Mission. Sadly, the comeback was short lived. The Justin Liquor Company finally ceased to exist, once and for all, in a few short months, leaving one final piece of rare advertising for us collectors to marvel over.